Do you use Google Maps much? I use it a fair bit not only for finding local directions and landmarks but also because I like maps for their own sake. 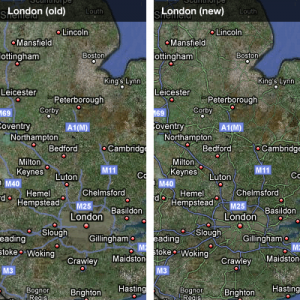 So, I was pleased to see that Google has updated its Google Maps to make them even clearer to view and more useful. Given that the range of information that’s represented on Google Maps has increased significantly over the almost five years it’s been around, it probably was due a facelift. Colours have been optimised, roads are clearer to follow, and there’s more detail when zoomed in making it easier to use the maps for navigation. Presumably, these changes will be echoed on mobile versions of Google Maps as well.